This weekend, I drove a friend's 2012 Jeep Patriot from Ontario to Nova Scotia, about 1800 km (~1100 miles). It's the 2.4L 4-cylinder engine, automatic CVT. 2-wheel drive. It just so happened it was a calm early morning when I left, so since I was going to be driving through one of my two ideal (smooth & level) "test courses", I did a speed vs. fuel consumption test with the Jeep. Note that these were not paired & averaged (E/W) runs. I just did one run at each speed (ie. went one direction, turned around and bumped up the speed for other direction. Rinse & repeat). Where there's a datapoint missing for a speed, it's because of (a) interference from other traffic, or (b) I screwed up the ScanGauge reset. Wind: light, N/W (6 km/h / 4 mph) That was a direct cross-wind on this NE/SW road. FYI, I managed 7.8 L/100 km / 30.1 MPG (US) for the trip, without trying too hard. Enjoyed the scenery! Main techniques used: drove smoothly; anticipated traffic lights & traffic speed changes in the towns & cities to minimize braking; manually short-shifted the CVT; kept my speed below 105 km/h (~65 mph) on the open road (110 km/h max limit); chose some routes with a 90 km/h (~55 mph) limit. There was a helpful tailwind for part of the trip. Cross winds much of the time, but never direct headwinds. What did you think of the fuel cut off as soon as you let off the gas? 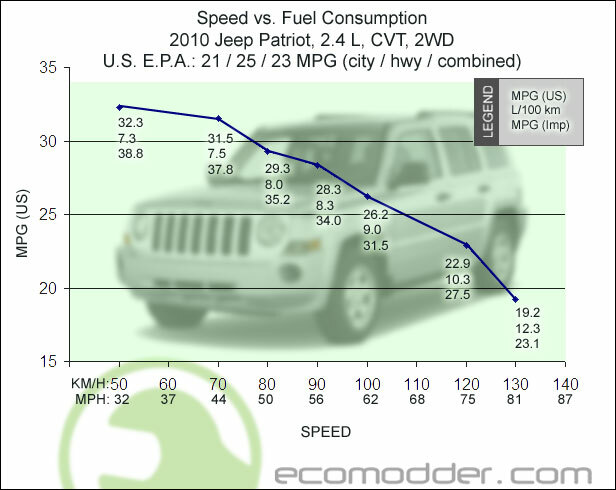 In my mom's 2008 Jeep Patriot the fuel cut off is annoying on the highway and nice in the city. On the highway I would prefer to be able to coast a lot longer and in town it's nice to not have to waste so much energy on the brakes. To be honest, I really didn't notice it. I am surprised the highest mpg was at 50 as opposed to around 80. Is that typical for CVTs? This is the first CVT I've driven. But it's typical for the majority of vehicles I've driven: best fuel economy is usually the lowest speed in the highest gear. 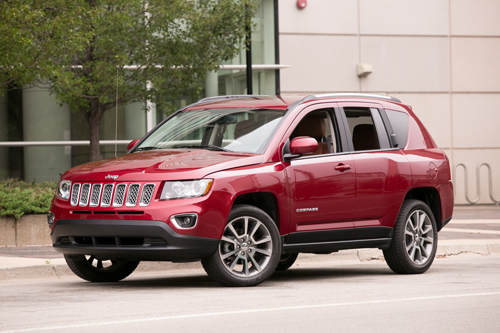 I own a 2014 Jeep Compass with the new 6 Speed Automatic. How well do you think an air dam addition up front would help the MPG in your friend's Patriot and my Compass ?? Individual aero mods are generally a per cent or two improvement. Small enough that even though there's an improvement, it usually disappears in the normal variability of tank to tank MPG. My Compass looks like this. I would guess a 8-10"'s (or so) to the bottom of the front lip. So extending that down with a piece of yard edging (4-5") wouldn't net that great of a gain in MPGs ?? 1-2% ? That's only a 0.25 - 0.5 gain in MPGs. That's sux. My Compass does have a small spoiler/aerlon on the top coming off the roof.